General information and assistance with Munt. I've been tweaking and tuning my old trio of IBM PCs for the best retro DOS gaming experience and I read that software like Falcosoft can emulate external MIDI devices using a Windows PC to run the software. But would a cheaper one like this work just as well? - I need a cable that converts gameport on the SBAWE64 to MIDI jacks - no idea where to find this locally but Aliexpress seem to sell some. - I need a M-M 3.5 audio jack cable to connect the headphone port to the LINE-IN port on my SBAWE64. Is this all correct and does anyone have any remarks on this idea? I did consider getting the actual hardware but there's so many standards that this seems by the far the easiest and cheapest way. red_avatar wrote: I've been tweaking and tuning my old trio of IBM PCs for the best retro DOS gaming experience and I read that software like Falcosoft can emulate external MIDI devices using a Windows PC to run the software. More or less. The basis for MT-32 emulation is the MUNT emulator. For Sound Canvas, Roland has a (commercial) emulator available. However, since Sound Canvas supports the General Midi standard, most synthesizers can be used to approximate the Sound Canvas, including Windows' built-in software wavetable synthesizer. Falcosoft's MIDI player can be used as an 'in-between', to route sound from the MIDI input of your PC to the synthesizer of your choice, and it can also help you to configure the synthesizer. Assuming the Falcosoft player runs on Vista, yes. In theory, any USB MIDI device would work. In practice, you get what you pay for, so the cheap brandless stuff may cause some problems. Roland is one of the brands that originally developed the MIDI standard, they have always been a safe bet. That TIE interface seems to look decent enough though, so I don't expect problems with it. red_avatar wrote: - I need a cable that converts gameport on the SBAWE64 to MIDI jacks - no idea where to find this locally but Aliexpress seem to sell some. They still seem to be available as new from various sources. They are also very simple to make if you are handy with a soldering iron. Given the USB MIDI devices you listed, yes, since they have male connectors only (intended to plug directly into another MIDI device). 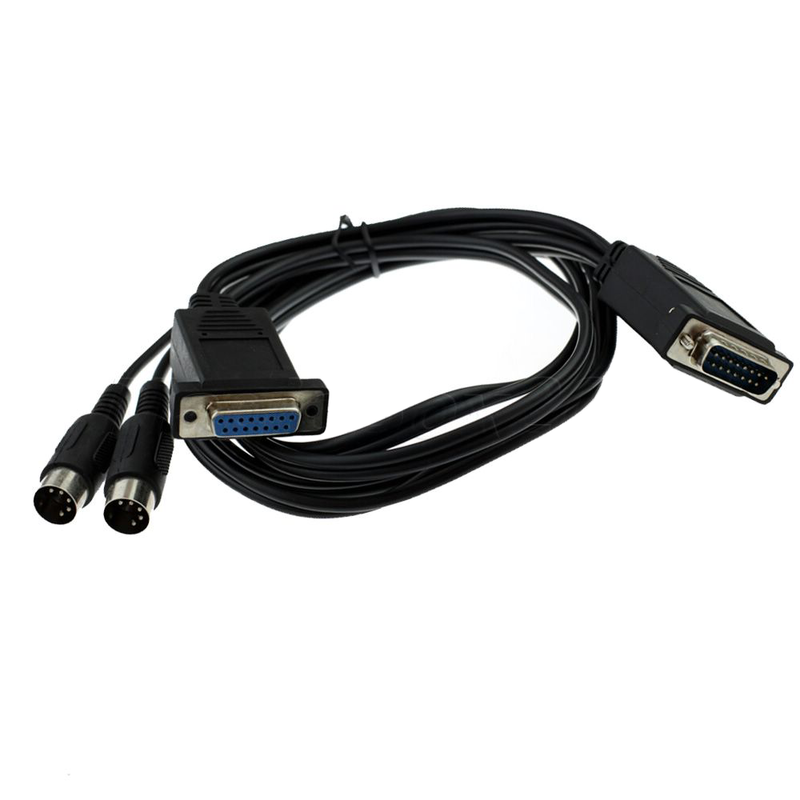 In that case the male connectors of the gameport->MIDI cable could plug directly into the USB MIDI interface. You only need to connect the MIDI out of the gameport->MIDI cable to the MIDI in of the USB MIDI interface though (games generally only use one-way communication with the MT-32 or Sound Canvas, and afaik DOSBox and SoftMPU do not even emulate the MIDI in part at all). red_avatar wrote: - I need a M-M 3.5 audio jack cable to connect the headphone port to the LINE-IN port on my SBAWE64. red_avatar wrote: Is this all correct and does anyone have any remarks on this idea? I did consider getting the actual hardware but there's so many standards that this seems by the far the easiest and cheapest way. I think you have everything covered. Thanks for your reply. I think I'll go with a MIDI F-F coupler since it seems cheaper than one of those MIDI-USB devices. Now I just have to find a gameport adapter and I'm set - I'd rather not do any soldering since I'd like to make this looks as clean as possible. Yeah both from China - I was hoping for something more expedient but Maldavia is the closest I could find so I just resigned to having to wait a few weeks and got it off Aliexpress. Still, been using MUNT with DOSBOX for over a year now and it's such a big improvement for so many games that its worth the wait. €34 in total to get much improved emulation. Thank you for the great software Looks like it will be a lot of fun to use.